I heard about it through Art and Christian Enquiry newsletter that I get and it seemed like an interesting idea . I like the idea of building up a sort of online illumination of the Bible, composed of new work in various media from many different sources. It will be interesting to see which [Bible] books get lots of attention and which prove harder to think about visually, which stories images tend to cluster around; this might be revealing about how the imaginations of people now are able to engage with particular themes and stories, and see where our imaginations are perhaps limited, where words and images begin to falter. RP: Are you self taught? Basically self-taught as a fine artist, but trained in graphic design. RP: So, how did you get started? I have never wanted to do anything other than draw and paint, so am not sure I can even recognize a starting point. Drawing, drawing and more drawing is my only answer! RP: What training/art education do you feel benefitted you most? It’s hard for me to know to what extent my training in graphics has helped my fine art, but it provided me with steady work for twenty years, and allowed me to make the move to being a full-time professional artist gradually. RP: Have there been milestones in your life as an artist? Being given my own wall at Junior school! While the teacher read to the class I was encouraged to create large wall-sized images – my first exhibition, the first time I realized I had something special and was encouraged to take it seriously. Discovering the art books in the school library at age 11. Looking at Picasso, Munch, Bosch, Leonardo, Klee, etc made me realize that I could do anything, that the only limits were ability and imagination. The ‘Twelve Mysteries’ sequence (2009) was a milestone for me, the first large-scale project which engaged with overtly Christian content, and one of these was bought by the church in my hometown, which feels quite special. Being asked to produce a design for an altar cloth for Winchester Cathedral. Even though I didn’t get the commission the resulting image “Parable” was very much appreciated, and it was very encouraging to be selected by one of the country’s greatest Cathedrals. RP: How do you choose your subjects? Certain subjects have remained over the years; wandering, solitary figures (human or animal) at some stage of a journey, often resting and held by nature, or figures who hold and protect some aspect of nature. This I’m sure is a reflection of my childhood, when I spent a lot of time by myself, wandering the gardens, fields and lanes of my home in rural Derbyshire, where I discovered the beauty and pain of nature. So these images chose me rather than the other way round, they formed as part of my own formation, and I use them to try and communicate something spiritual and mysterious that I found then, without being too specific about what that mystery might be. The more overtly Christian imagery is chosen more consciously, though again it is often figures or stories that stay with me – haunt me you could say – that I end up painting. RP: Do you develop and work through themes or do subjects/pictures arrive out of the blue? Much of the time images arrive unbidden; I make some marks and see what emerges, and this is a method of finding images I’ve used since childhood, when I would ask family members to draw a squiggle and I would make something from it. But I also get ideas from the Bible, poetry, lines from songs, from folklore, occasionally from dreams. Sometimes these have grown into very developed series and sequences of pictures; ‘A Garden in Darkness’ explored the garden of Gethsemane through natural imagery; ‘Earth, Air, Fire, Water’ sought to reimagine the symbols for the four evangelists using the four elements. RP: What other creative or practical work do you enjoy, or are you totally focussed on visual art? I still do bits of graphics which I enjoy as a change from the much more difficult work of painting and drawing. Words are important to me, they are often part of the process of creating a piece, and as well as drawing inspiration from poets I sometimes write my own, and I can sense that this aspect may grow. I’m currently working on an illustrated story, a sort of fable for all ages. RP: Are there artists or works of art that have particularly influenced you? Picasso’s melancholy paintings from his blue period were some of the first images that really moved me, as well his cubist works. Other painters too from the same period, Franz Marc, Paul Klee, and especially the German American painter Lyonel Feininger. As well as these Modernist artists, you can also see the influence of religious art – stained glass, illuminated manuscripts, tapestries and icons, though perhaps these influences are less evident in my more recent work. RP: There are elements of cubism in the way you build a shape, but also there’s a vivid English Romanticism in the world you’ve created – how would YOU describe your work? I think my work falls into two groups that sometimes merge but at others can seem quite distinct. One strand could be seen as being in the British Neo-Romantic tradition, and interestingly I had already formed much of the trademark imagery associated with the Neo- Romantics long before I became aware of them as an identifiable group; figures on long journeys, aspects of nature as metaphor for human emotion, landscape suggestive of inner journeys and destinations – even the use of thorns and spiky foliage, which artists like Graham Sutherland, John Craxton and Ceri Richards all explored several decades ago. The other strand of work is more concerned with figures that embody a kind of Christian attitude and connect obliquely with religious painting of the past, or which uses natural imagery to suggest connections with Christian narrative. So without necessarily leaving the natural imagery or the Modernist influences behind, I’ve been able to tackle overtly Christian themes, filtering religious stories or figures through my imagination and my developed style. RP: I’ve noticed there’s always a narrative inherent in your paintings…are you conscious of the story, and put clues in for people to find, or is it more a subconscious process and the viewer is just given a starting point? There is a natural tendency for me to hint at narrative, this is inescapably how I see things; I see a nest in a hedge and I sense that as part of a story – whether it is abandoned, or whether it contains eggs, there is a little story going on there which I see only a bit of. I like to hint at some larger meaning which the viewer may or may not catch onto. It’s not necessary to know and understand the ‘clues’ or the story that lies behind the image, as these are often a way of coming up with the imagery in the first place, of enriching an idea, of making sure it doesn’t simply become an illustration, which is always one of the perils of producing narrative paintings. Illustration, however skilful, leaves nothing for the viewer to really engage with, its purely about conveying information/ideas, whereas I want people to be drawn into a narrative in a deeper way – you have to leave some kind of ‘space’ for that to happen, something that keeps you looking, that stays with you, even if you do not understand fully why. So there is often a kind of restraint in my best work, a conscious decision to draw back from giving too much away; the danger then is of becoming merely obscure, so it is a sort of balancing act. RP: Finally, I’d like you to talk about the piece “Running Man“, looking at its genesis, development, personal inspiration, emotional payload, in effect the journey of the creation of the artwork itself. Based on Mark 14:51-52, ‘Running Man’ was the first piece I did in a series called ‘Twelve Mysteries: nameless, marginal and fleeting characters from the four gospels‘, which was a collaboration with writer Rosalind O’Melia. For many years I had been fascinated by some of the small, seemingly incidental figures in the gospels, in particular the blind man who sees people like trees as his sight is restored, and the man who runs away naked in Mark’s account of the arrest of Jesus. There is something convincing and real about them, and this quality was important to me. I decided there was sufficient life in these and other fleeting figures to warrant a series, and a friend suggested there should be twelve, which seemed right; twelve lives changed by their encounter with Christ, but who were not disciples as such, marginal to the story. I felt this is very much where many people find themselves in relation to Christ/Christianity now, and thought this would be a way of helping people relate to the story. So I went through the gospels and made a list of all the possibilities, then narrowed that down to ones that really intrigued me. Early on I decided not to show the figure of Christ; I thought that (paradoxically) His presence would become more powerful if the viewer saw only the effect he had on these people, and I think I was right about this. I asked Ros if she would write some responses to the images as I created them, and we exchanged (emailed) thoughts in the process, and sometimes her thoughts would help me in creating the image, and phrases which had come up in conversation might find their way into her final response. Stylistically ‘Running Man‘ draws on the usual influences; cubism and the modernist painting of the early 20th century, and perhaps also the graphic design of the time too. It also relates to one of my usual themes of figures and the natural world, but unusually nature here is seen as holding the figure back, hindering his progress, which is the very opposite of my usual concern to show nature as nurturing and protecting; this is a constraint of the narrative – the man is running away from his true self, so nature becomes an obstacle. The finished series was shown in the wonderful Norman church in my hometown of Melbourne, Derbyshire. The images were displayed with the original texts that inspired them as well as Ros’s words, and the response from visitors was amazing. It had always been my intention that the series should engage particularly with those without faith, and this did happen. Since then the words and images have been used fruitfully in prayer/meditation groups. 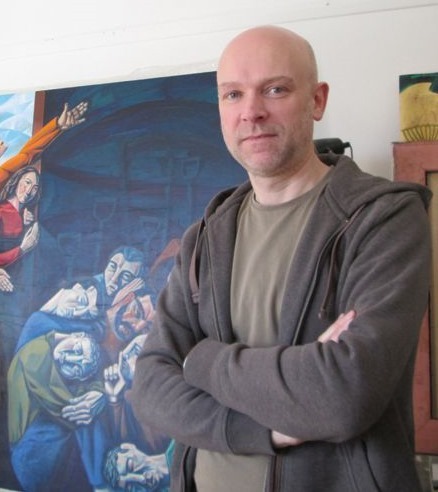 I am an artist whose work has become increasingly about exploring faith. Sometimes my work is drawn directly from Biblical passages and themes, and sometimes more generally seeks to evoke feelings of mystery or wonder, whilst not shying away from the difficulties of belief; doubt, loss or the experience of God’s absence. Light and dark, dawn and dusk, journey and rest, absence and presence are the recurring themes. Jacob wrestling with God is the text that most of all defines my faith and my work. The Rockpool Project would like to thank Michael for his time and, for the wonderful contributions he has made to the project thus far – we look forward to seeing more of his work on the site. You can contact Michael via his website or his twitter feed (links above).